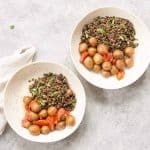 Lentil and Potato Harissa Buddha Bowl! This vegan and gluten-free buddha bowl is perfect for easy dinners. Packed with plant-based protein, so much flavor and a sweet & spicy harissa dressing. Preheat the oven to 425 degrees F. Remove the packaging from the potatoes and toss with seasoning packet and drizzle of olive oil. Place in the oven and cook for 15 minutes. After 15 minutes, mix in the cherry tomatoes to the same pan and place back in the oven to cook an additional 15 minutes, or until potatoes are done. While the potatoes are cooking, make the lentils. Bring the vegetable broth to a boil in a medium saucepan and add the lentils. Reduce heat to low, cover and simmer until the lentils are tender, about 25-30 minutes. While the lentils are cooking, whisk together all ingredients for the dressing together: olive oil, harissa paste, salt, pepper, red wine vinegar, maple syrup and ground coriander. Taste, adding in more salt/pepper as desired. Assemble. Toss the cooked lentils with 1/4 cup of the dressing until well combined. Divide the potatoes among bowls and top with the cooked lentils. Drizzle on remaining dressing.